I can’t get enough of bright colored suits lately! (See this post for another one) I love that bright colors are back in fashion for suits – especially pant suits. To keep the look from feeling too 1980’s, opt for trendier accessories to compliment your suit. This can be an on-trend bag (I am still swooning over this one) or – my personal new favorite thing – running shoes! I fell in love with these running shoes from Boden the moment I saw them. Embroidery has been everywhere this summer, but I had never seen embroidery on sneakers until these shoes. I absolutely love the crisp white against the colored embroidery; such a beautiful and unique shoe! A suit worn with running shoes is a trend I definitely see myself carrying over into the fall and winter – it just feels so fashion forward/trendy but also allows for comfort! I hope you all have a great Friday and got to enjoy the fact that it was a short work week! I had a really busy week and am looking forward to some down time this weekend. "Lilac & A Midi Skirt"
This would totally fly at my work-place and I love that you came up with this idea. The emerald color is gorgeous on you and I just love the pretty embroidered runners. The perfect combination of dressy and chic athleisure! Aw thank you Ada! You should totally rock this outfit!!! What a fabulous suit!I would love to wear that at the weekend! And tonwear that with sneakers is a great idea. it makes the outfit very stylish and trendy! Thank you so much Nancy! Im so glad you like it! Woah, this green suit is stunning on you! 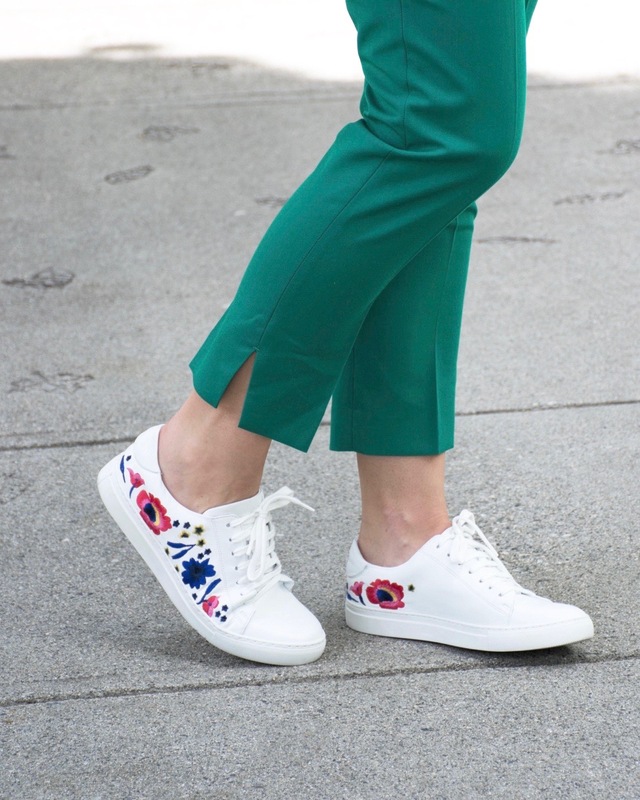 Your embroidered sneakers look adorable with it. Thanks for linking up with Fabulous Friday! Aw thank you Jennie! I am so glad you like it!